Two years after his battle with cancer resulted in a shortened prison term, former House Speaker Salvatore DiMasi is stepping back into the public eye, offering harsh criticism of the federal Bureau of Prisons and indicating a desire to be an advocate for the better treatment of prisoners. The former North End politician said Wednesday that the cancer that led to his "compassionate release" from federal prison was in remission, and he called the Federal Bureau of Prisons a "rogue, rogue agency." DiMasi's comments came during his first public interview since a federal judge allowed DiMasi to be released from prison due to his declining health after he served five years of an eight-year sentence for public corruption. The former lawmaker returned home to Boston from a North Carolina federal prison in November 2016. "My health is much much better. I'm in remission. I'm lucky," DiMasi told WGBH's Jim Braude during an interview on "Greater Boston," which aired Wednesday night. DiMasi said he had been battling both throat and prostate cancer, and backed up his wife Debbie DiMasi who had publicly advocated for her husband's release and said he was being denied medically necessary treatment in prison. "Yes. It's systemic with the organization. The Bureau of Prisons does not provide the health care needed, not just for me, but for anybody," DiMasi said. DiMasi was back on Beacon Hill a day earlier where current House members had gathered to listen to their colleagues who will not be returning next year give farewell speeches. 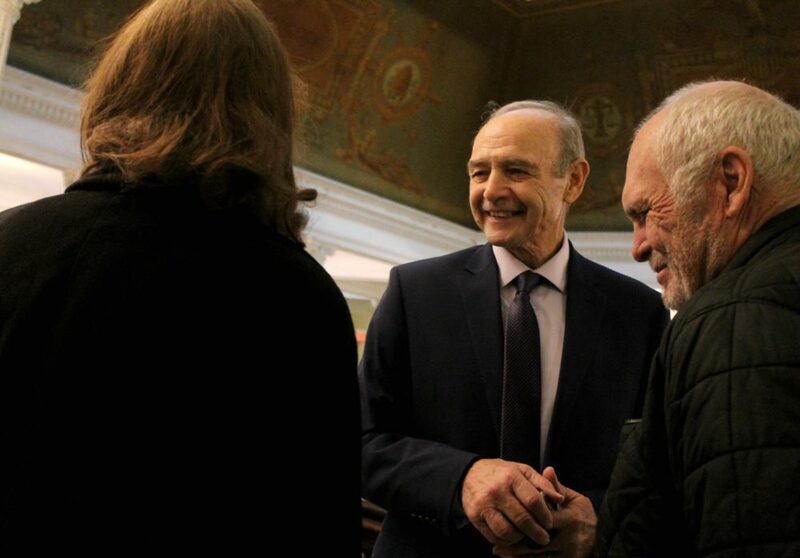 DiMasi said he was "nervous" to return to the building that he commanded for almost five years as speaker, but humbled by the reception he received. Members applauded Wednesday after House Speaker Robert DeLeo, DiMasi's successor, introduced his predecessor, a floor guest of the House. DiMasi spent 30 years in the House, and served as speaker from 2004 until his resignation in 2009 under a cloud of suspicion. He would eventually be indicted and convicted in 2011 for his role in a scheme to steer almost $18 million in state contracts to the Burlington software company Cognos in exchange for $65,000 in kickbacks concealed as payments from his law associate. DiMasi did not want to discuss the charges or his trial in the interview, but struck a somewhat defiant note when he said it could be difficult for public officials to always see the "bright line." "I spent probably the last 10 years trying to put all of that in the past...," DiMasi said. "I did the best I could under the circumstances presented to me and I tried to comply with the law." Asked if he thinks he broke the law, DiMasi said, "The complications of my case still need to be discussed as to what the merits were." "That is in the past and I understand how people might see than differently than I would," he said. DiMasi said he's tried to let go of anger and is happy after navigating a "long, tough road." The former speaker also said he wasn't worried about his legacy, and was proud of what he had accomplished as a legislator. During his career, DiMasi fought to preserve gay marriage, keep casinos out of Massachusetts and played a significant role in writing the universal health care law that became the model for the Affordable Care Act. He also worked with former Gov. Deval Patrick to pass landmark climate change legislation and a $1 billion investment in life sciences. "You can try to taint the good-deed doer, but you can never taint the good deed," DiMasi said. DiMasi said that for a time he thought he would die in prison. And while he said he thinks he got what he deserved with a "compassionate release" and not special treatment, DiMasi said he was "disgusted" with how the federal prison system handled other prisoners' requests for medical release. By publicizing DiMasi's health struggles and her quest to win him medical release, Debbie DiMasi played a significant role in pushing lawmakers on Beacon Hill to adopt a medical parole law that was signed by Gov. Charlie Baker. DiMasi said he was grateful that his case helped create momentum for the issue, but doesn't want to stop there. "Am I dedicated right now to make sure that I can try to change prison reform, that I can try to change compassionate release, health care for prisoners, the criminal justice system. Yeah, I'm going to work on that. I'll speak on it anywhere I can," he said. DiMasi is expected to attend an event next Tuesday morning at the BC Club where the Massachusetts Housing and Shelter Alliance will be honoring Rep. Jeff Sanchez of Jamaica Plain, who lost his re-election bid to Democrat Nika Elugardo in the Sept. 4 primary.